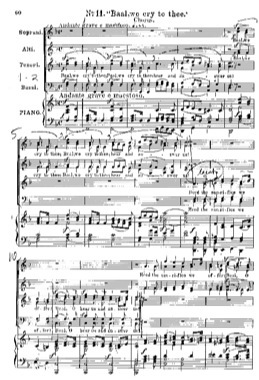 John Maclay, the director of the Grace Church Choral Society, agreed to let me sing in our Spring performance of Mendelssohn’s Elijah, even though I’m here in Durham and will miss most of the rehearsals. Yay! I love this piece. I brought my score with me and I’m working on the same choruses and in the same order that my choir is working on them in New York. John is making this easier by sending us all the pieces with the dynamics he wants and other markings, before each rehearsal. Isn’t sheet music beautiful?